First of all I would like to say that, this is not the actual Micromax Tablet. This is just an imagination from my side which may or may not be true. So I request you not to ask me launch dates and all that kind of stuff. It is just because there is nothing official from Micromax. These are just my expectations from Micromax. If you have your own expectations, do let me know in the comments section. So lets begin the my imagination. Recently Karbonn had rolled out some new tablets in the market. If you would have noticed, every tablet had a dual core processor clocked at more that 1 GHz . They also had 1 GB of RAM. So according to me, Micromax would try to overtake Karbonn in terms of specification. Since dual core processor has become common in the Indian tablet market, Micromax would try to launch a Quad-Core Processor in the market. This is not the actual tablet, but a version designed by me using Photshop CS 5. Talking about Quad-Core Processor, Micromax should try to use the Nvidia Tegra 3. I tried to find out the price of 1 Tegra 3 processor. It turned out to be that, 1 Nvidia Tegra 3 Processor costs about $15 to $20. That's a great price and if Micromax tries to include the Tegra line of processor, it will be a great thing for the Indian Tablet Industry. This will give a new benchmark to the tablet sector. Micromax will also try to increase the screen resolution of their display. But the main thing they should try to increase is the Pixel Per Inch. This is the main factor of a brilliant display. The screen looks vibrant when you can't make out the individual pixels with your naked eyes. A higher PPI will result in a colourful display. The RAM of the device can be 1 GB but Micromax should even try to increase that to about 1.5 GB. That will truly tremble the tablet sector and set new benchmarks. The rear camera should be something different from the usual low quality cams in the tablet market. Just increasing the Megapixels won't do, but they should try to increase the picture and video quality. Another major factor that is very important is the battery. Micromax should try to get a good battery with higher mAh so that the consumer can experience the tablet for much longer period of time. 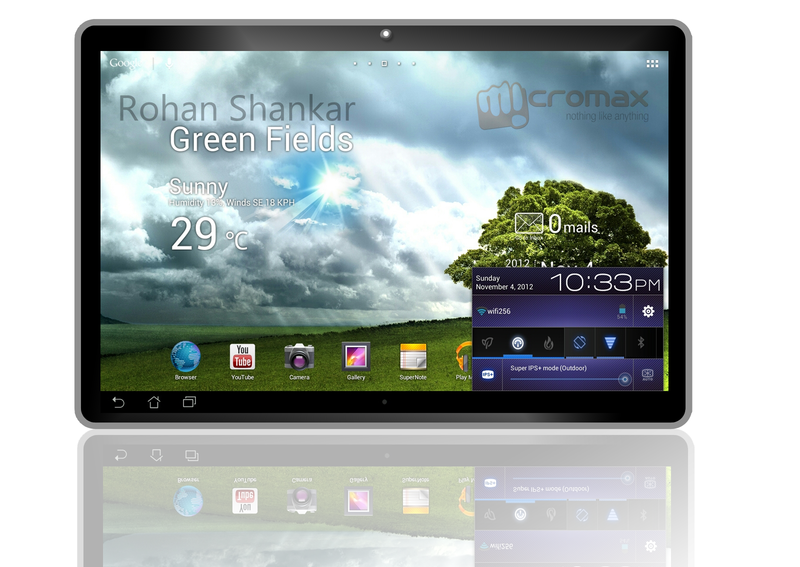 Micromax should try to release two versions of the tablet just like they did with the Funbook. A 7" version which should be priced around Rs 5000 - Rs 10,000 and a 10" version which should be priced around Rs 10,000 to Rs 15,000. So these are my expectations from Micromax. What are your expectations from Micromax, do tell us in the comments section below. Please share this article by using the Facebook, Twitter and +1 buttons below. Also read about Micromax Canvas 3. Excellent !! You have set right expectations. These specs would become bare minimum very soon, down the line.